My name is Kitty de Graaf. I was born in Harderwijk in 1971 and grew up in a little town called Sint Maarten, in North-Holland. After high school graduation, I enrolled in the four-year goldsmith program at the Vakschool Schoonhoven trade school. Here I was able to develop and apply my creativity and talent in designing and creating jewelry, graduating with flying colors in 1993. I’ve enjoyed an instructive career at various jewelry stores for over 20 years. At the end of 2014, the opportunity of setting up my own workshop in Schagen presented itself. 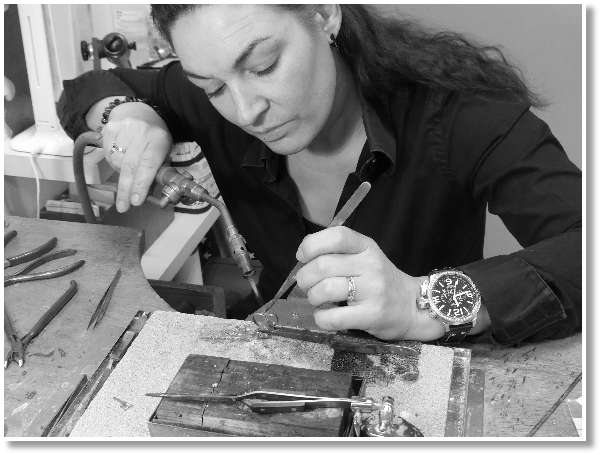 I started out in January 2015 together with Henk Houkes, Schagen’s well-known clockmaker and clock restorer, a passionate craftsman making time. And since 2016 I’m also member of the Dutch Guild of Goldsmiths. Good quality and a friendly service are very important to me and every piece is made with pure passion and trained skills! If you are really looking for something extraordinary ! !